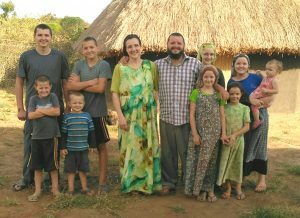 Marc and Cindy Carrier (along with their ten children) have been in Kenya since February 2012. Marc’s commitment to serving God and expanding the Kingdom is evident as he spends long hours teaching and traveling, meeting with satellite fellowships and their leadership, writing and publishing, and often coming home to invest his free time in KDM administrative work, meetings with local disciples, and various other tasks that constantly demand attention when one serves as a missionary in Africa. Cindy spends most of her days discipling and homeschooling the Carrier children, who range in age from newborn to 18. Keeping the dust (in dry season) and the mud (in rainy season) out of the house poses a constant challenge (as if the children’s messes weren’t enough!). Yet all this is necessary, as Cindy strives to keep the house always open and welcoming for the guests who inevitably come: one-by-one for an hour of conversation or a weekend of fellowship, thirty at a time for a few hours of teaching (plus chai and lunch), and occasional groups of short-term missionary visitors who stay for a week or two. Cindy also tries to connect with the women in the local fellowship as often as possible.